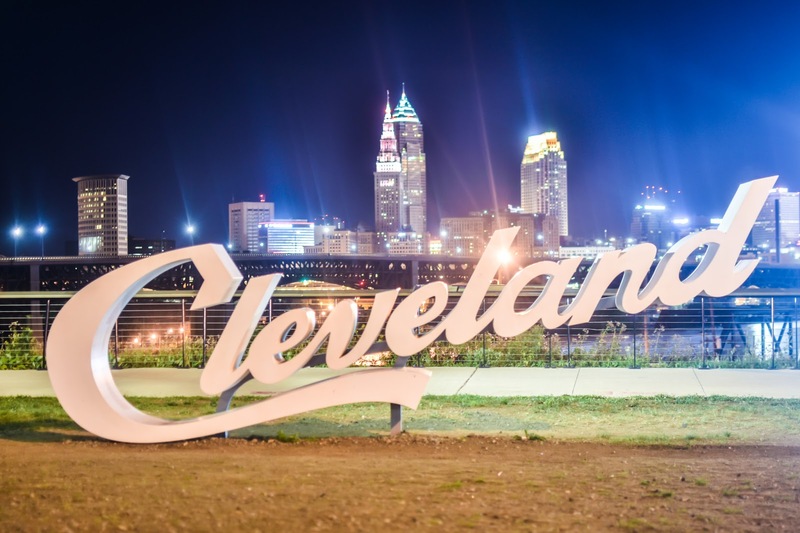 It's time to give Cleveland the love it deserves. We've just got back from a long weekend up on the banks of the Erie and had a great time. In fact, we found some many things to do and places to eat that we definitely need to go back. But so many people thought we were mad for going there. 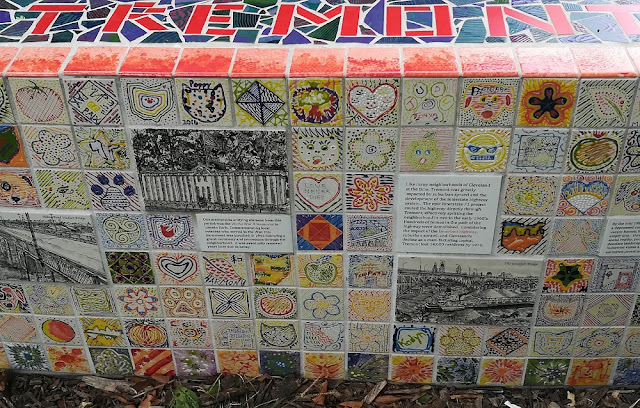 So if you've tended to dismiss Cleveland as not being worth a look (and I admit I was one of those at one time), here are a few reasons to think again. We drove up from Lexington, KY on a Friday, arriving in Cleveland at about 3pm. Time to check in to the hotel and take a quick breather before heading out to our first stop. Cleveland Museum of Art. Courtesy of ThisisCleveland.com. Cleveland Museum of Art. By far, one of the better art museums I have been to, the Cleveland Museum of Art houses a magnificent collections that includes works by Dali, Picasso, Van Gogh, Monet, and many more of the masters. Whether your taste leans to ancient Greek, far Eastern, medieval religious, contemporary American, or sculpture, the museum will have something to whet your appetite. We had not bought tickets to the Yayoi Kusama exhibition and it was sold out by the time we got there, but that didn't matter as there was still so much to see. Be sure to check out the William Morris room. 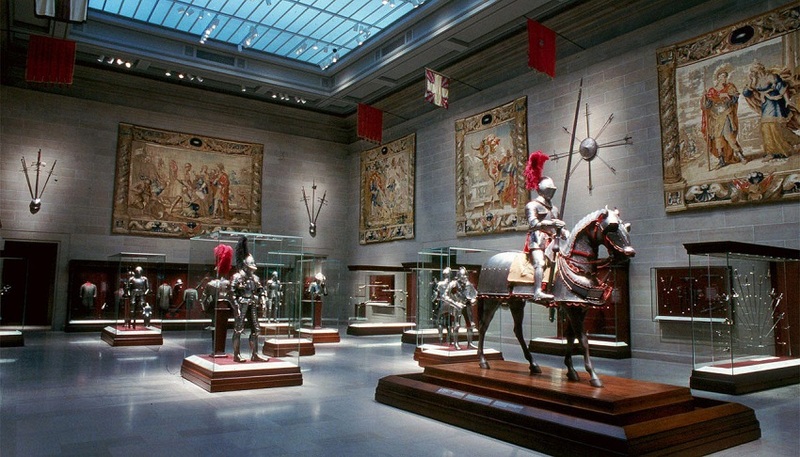 The Cleveland Museum of Art is open Tuesdays through Sundays from 10am. Admission is free. There is a charge for parking. 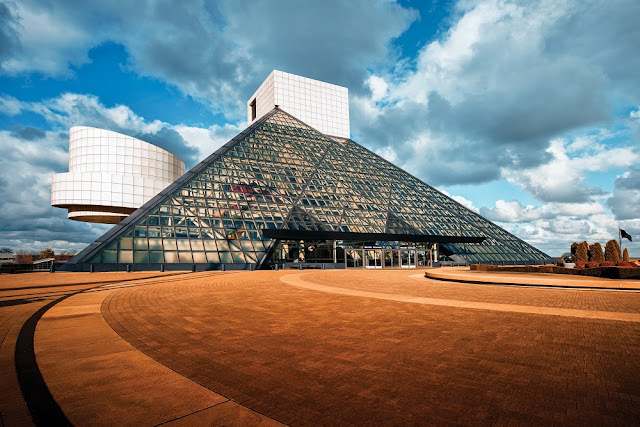 Courtesy of ThisisCleveland.com and Rock n Roll Hall of Fame. Rock & Roll Hall of Fame. If you're a music lover, you can't visit Cleveland without spending some time at the Rock & Roll Hall of Fame so that was our first stop on Saturday. As with the Museum of Art, there is something for everyone. The museum starts downstairs with early blues and works its way up several floors, charting the history of popular music. Along the way you'll see exhibits and memorabilia from such greats as Elvis and Jimi Hendrix, and covering such events as the Summer of Love, the rise of punk, and much more. See who has been inducted on Level 3 and cast your own vote for who you'd like to see in the next class. (Votes for Warren Zevon from the both of us!) And on the higest floors, you can see a series of exhibits about music on TV and music video. But for us, the highlight was the musical performances. The Power of Rock Experience is a short film by Jonathan Demme that shows some of the induction highlights and which closes with a mindblowing guitar performance by Prince. In another theater, a four hour recording from Madison Square Gardens plays on a loop. Stay and watch the entire show or just sit and enjoy a few clips. (The Mick Jagger and Fergie performance with U2 is excellent). Plan to spend at least a couple of hours here but you'll probably want to linger and recapture favorites from your youth. The Rock & Roll Hall of Fame is open daily from 10am to 5.30, with later hours on Wednesdays. Buy tickets online before you go to save a few bucks. 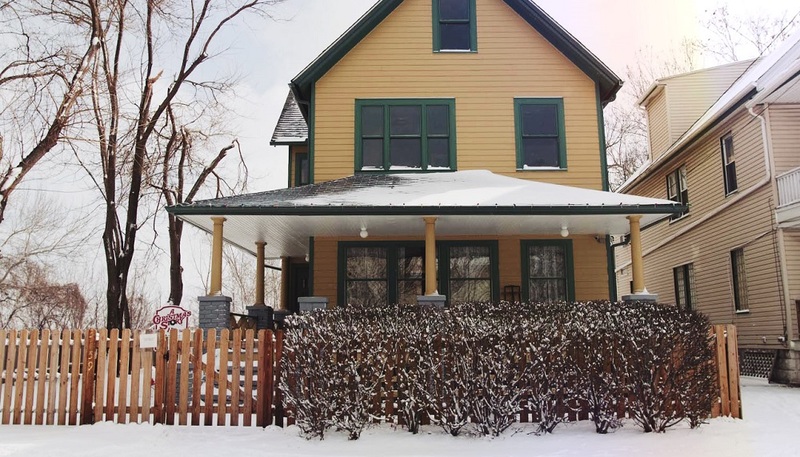 A Christmas Story House. Author Jean Shepherd may have grown up in Indiana, but anyone who has seen the movie adaptation of his beloved book will recognise this house, used in the filming. Take a tour of the museum and the house and see tons of memorabilia from the Christmas classic, including of course the infamous major award lamp. After looking around, buy your own leg lamp or bunny suit in the neighboring gift shop. Or book an overnight stay. The house is open every day with the first tours at 10.15am. 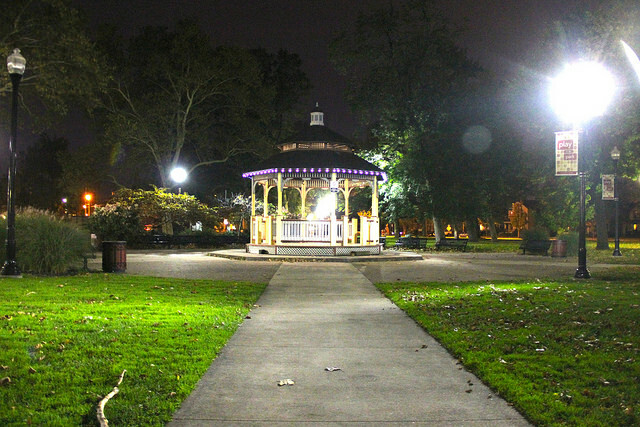 Lincoln Park, Tremont. Photo by Daniel X. O'Neil. The house from A Christmas Story is in Tremont, which was convenient for us since our next Saturday adventure was a food tour of the area with Taste of Cleveland. For three hours our guide Fallon shared the district's history with us as we stopped off at several local restaurants to try their wares. 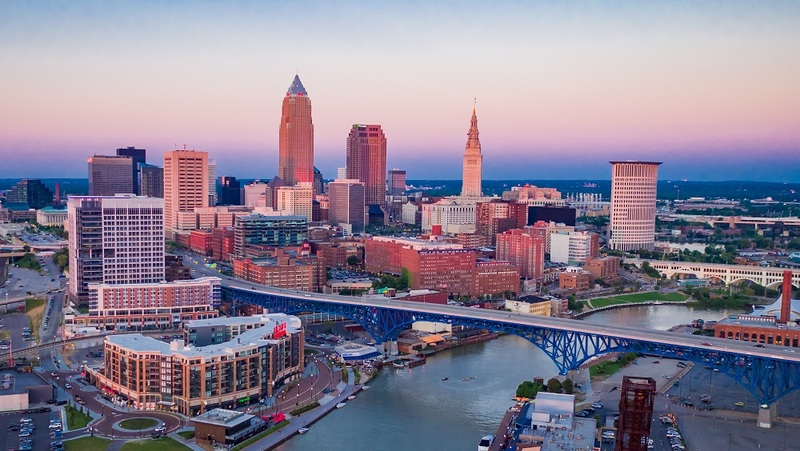 Taste of Cleveland also operates food tours in the city's West Side Market and Little Italy. If you remember, we took a food tour with Taste Indy a few years ago. This is run by the same folks so you won't be hungry by the end of the evening. Cleveland Metroparks Zoo. On Sunday we faced the drive back to Kentucky but we weren't ready to leave just yet. A brochure in the hotel room mentioned that Cleveland's zoo had one of the largest collections of primates in the nation. Enough said. The zoo is set on 183 acres and is nicely laid out. We got there at opening time, which as great as we were able to chat with one of the keepers and learn more about the snow leopards. The selection of animals was impressive, and because the zoo was so spacious, it never felt overcrowded. We spent a little over three hours here, but could have happily lingered for longer. We enjoyed some great dishes so below are the restaurants that featured on our food tour and another excellent discovery. Der Braumeister. Our first evening in Cleveland, good beer was a given. But what we also wanted was some good German food. Der Braumeister did not disappoint on either count. The traditional wooden decor took me back to my summer spent working in Bavaria. The servers were very knowledgeable about the beer and were spot on with their suggestions. Meanwhile, the food was wonderful. We started with some lox and cream cheese. Then, Nic had the sauerbraten with spatzle while I had a sausage plate. Lastly, although stuffed to the gills, we wouldn't resist sharing a slice of strudel, fresh from the oven. The SouthSide, Tremont. The first stop on our Taste Cleveland tour of Tremont was this restaurant and bar on West 11th. 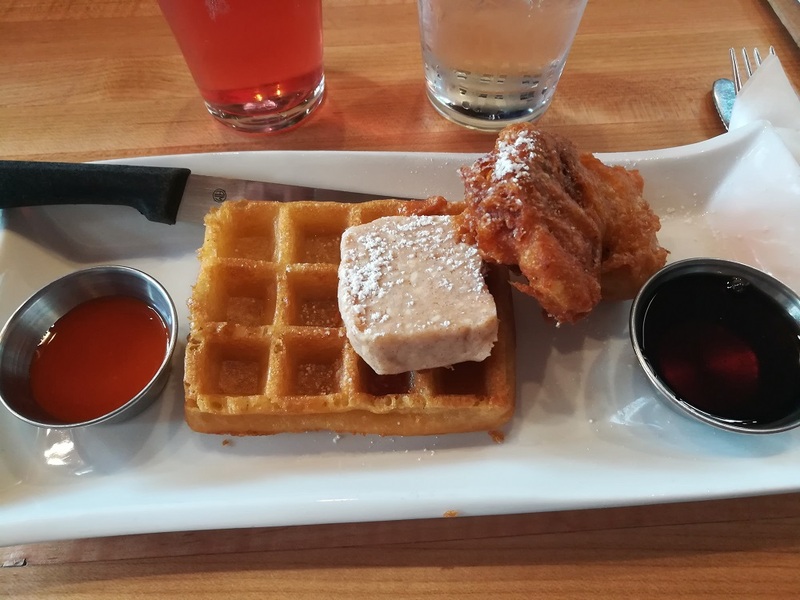 And despite having lived in Kentucky for 17 years, it took my first trip to Cleveland for me to try chicken and waffles, complete with a rich maple butter, maple syrup and hot sauce. Apparently they have one of the best Bloody Marys in the city but I've never been able to face drinking anything with tomato juice. Parallax, Tremont. Further along West 11th, Parallax is the flagship of a series of restaurants around the city owned by renowned chef Zach Bruell. Its menu offers fusion seafood and sushi. 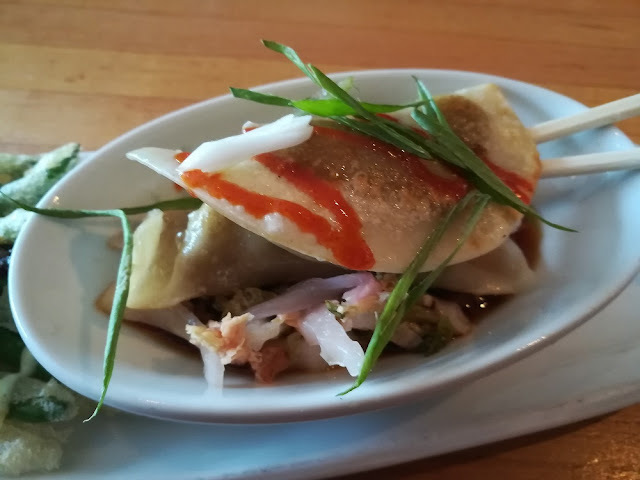 We were treated to tempura green beans and hanger steak pot stickers. Fallon tells me the cocktails are also very good. Ty Fun, Tremont. Next stop was Ty Fun, and don't fret about the pronunciation. We were told that chef and owner Sunny Ting pronounces it one way, and his sister and co-chef pronounces it another! 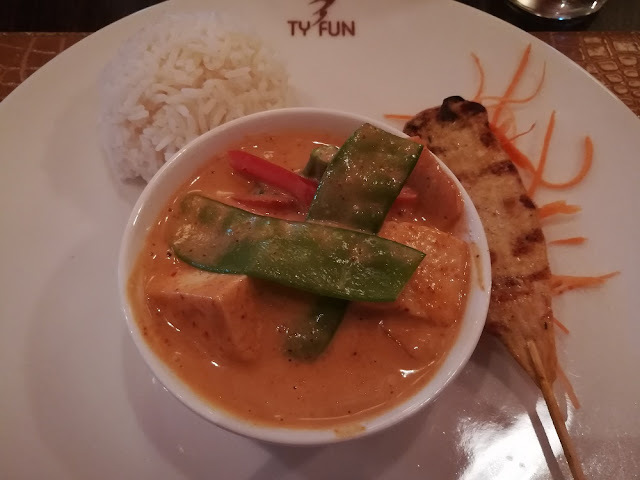 We got to taste the chicken satay and a sweet chicken curry which also featured Sunny's homemade tofu. Needless to say, both were delicious. Tremont Scoops. You can't have a food tour without dessert, so our final stop in Tremont was Scoops for ice cream. Be sure to stop by for a cup or cone if you find yourself in the area. Vegan and dairy-free offerings are also available. Although our stay in Cleveland was short, we managed to pack a lot into it and we enjoyed it all immensely. I had honestly expected a grimy industrial city. Instead we found a vibrant city with plenty of great attractions and some fabulous dining choices. And since there are still lots of other places there to explore, I believe a second trip may be in my future. Cleveland looks a very interesting place to visit. Rock & Roll Hall of Fame would definitely be on my list of places to visit. Having watched The Christmas Story many times, this would have to be on the list. The food looks delicious!